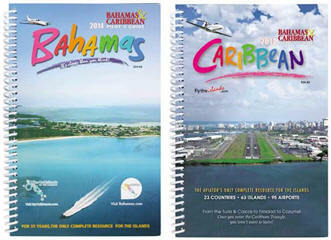 December 3, 2013 - The Bahamas & Caribbean Pilot’s Guide, in its 35th year, has some exciting new changes for 2014. The Pilot’s Guide has been split into two books: A Bahamas Pilot’s Guide for the Islands of the Bahamas, and a Caribbean Pilot’s Guide for the Islands of the Caribbean. As always, both books include the updated airport data and information pilots have been relying on for the past 35 years. Pilot’s have been requesting this for years and it’s finally happened. This split allows the pilot to pay for only the region they want, and pay less for that region. There are also some welcome design changes. Each book is obviously noticeably smaller with a slightly reduced page size which makes it easier to hold and has a “softer” feel. The new spiral binding allows the Guide to be folded back on itself, a nice feature in the cockpit. The tabs are now printed on every page, making the Guide more compact. The change to printed tabs makes it easier than ever to find the island or country you’re looking for. The Bahamas Pilot’s Guide covers all the Islands of the Bahamas and only the Bahamas. The Caribbean Pilot’s Guide covers all the Islands of the Caribbean: the Turks & Caicos, Hispaniola (Dominican Republic, Haiti) and Cuba, the Western Caribbean (Cayman Islands, Jamaica, The Yucatan, Belize and Honduras), Puerto Rico and the Virgin Islands, the Eastern Caribbean from Anguilla through the ABC Islands (Aruba, Bonaire and Curaçao). Going to the Bahamas? Get the Bahamas Pilot’s Guide. Going to the Caribbean? Get the Caribbean Pilot’s Guide. Going to both? Get both! Pay only for the regions you want. Both the Bahamas Pilot’s Guide and the Caribbean Pilot’s Guide have complete airport information, hundreds of color photos, accommodations and tourist listings, and area maps to help you plan your trip and get around once you are there. Like the book? Love the app! The Bahamas Pilot’s Guide and the Caribbean Pilot’s Guide are both available on the iPad. Need a chart to plan your routes? Buy their printed color VFR charts for each region, or purchase the app versions on iTunes. With the separate books comes a new, low price. Enjoy each Pilot’s Guide for only $34.95. Whether visiting the Bahamas, the Caribbean, or both! Enjoy the new Bahamas and Caribbean Pilot’s Guides (for more information).